Yes, you can go home again. For 2008, the World Solo 24 Hours of Adrenalin Championships will return to where the Championships began 10 years ago: the Canmore Nordic Center at the foot of the Canadian Rocky Mountains. The races will take place July 26-27, 2008. 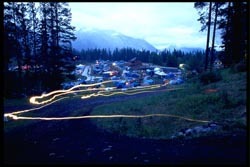 One of the most beautiful locations in the world, the Canmore Nordic Center, which hosted the 1988 Winter Olympics, will welcome 200 solo riders and 1,450 team athletes as they compete in front of thousands of spectators and support crew along a specially-designed, fan-friendly, athlete-challenging figure-eight course. The Solo Championships, won by Rishi Grewal and Chloe Lanthier in the event's inaugural competition in 1999, are open to both men and women on single speed and multi-geared bikes. The multi-geared bikes category will award prizes in five-year, age group increments from under 25 to 60+. In addition, the Elite men and women class will carry a cash purse of at least $20,000. The team racing at the 24 Hours of Adrenalin in Canmore has become so popular that the 2008 race sold out in 2-1/2 days a year in advance. The 1,450 team riders will compete on the same course as the solo riders in four-person open teams, five-person age-category teams and 10-person corporate teams. "We're pouring everything we have into the 2008 World Solo 24 Hours of Adrenalin Championships," says Stuart Dorland, founder of the World Solo 24 Hours of Adrenalin Championships and the 24 Hours of Adrenalin race series. "The Canmore Nordic Center has hosted a 24 Hours of Adrenalin event for 13 years and from 1998  2000, the UCI Mountain Bike World Cup, so the facility is no stranger to world-class events. And I guarantee you, the 2008 World Solo 24 Hours of Adrenalin Championships are going to be world class." The Canmore Nordic Center, which has just finished a three-year refurbishing project including the opening of a new lodge, is located 80 minutes from the Calgary International Airport and a five-minute drive to world famous Banff National Park, which makes the Center the perfect family vacation spot. In the past, athletes and spectators have planned their holidays around the 24 Hours of Adrenalin races exploring the spectacular Canadian Rockies and the scenic towns of Canmore and Banff. For more information on all 24 Hours of Adrenalin events, go to www.24hoursofadrenalin.com. The highly popular 24 Hours of Adrenalin mountain bike races have been taking place since 1994 with the World Solo 24 Hours of Adrenalin Championships first hitting the trails in 1999 when Rishi Grewal won the men's competition and Chloe Lanthier the women's. All 24 Hours of Adrenalin events offer both solo and team competitions. For details, check out www.24hoursofadrenalin.com.